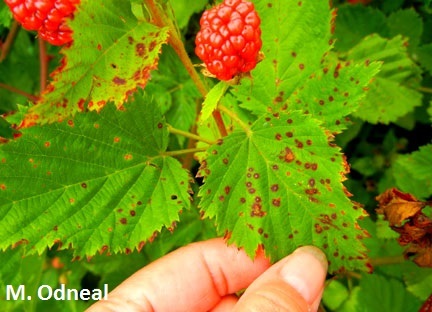 Raspberry anthracnose is caused by the fungus Elsinoe veneta. All species of Rubus are susceptible. The fungus overwinters as mycelium and immature fruiting bodies in infected plant tissues. In spring, spores (both ascospores and conidia) are released from mature fruiting bodies during wet weather and are dispersed by splashing rain, wind, and insects. Young green plant tissue is most susceptible to infection. Spores germinate on wet plant tissue in 3-12 hours. Lesions begin to appear 1-4 weeks later. Conidia produced by fruiting bodies in these lesions may produce a second round of infections in late summer. Symptoms on canes include stunting and loss of vigor. 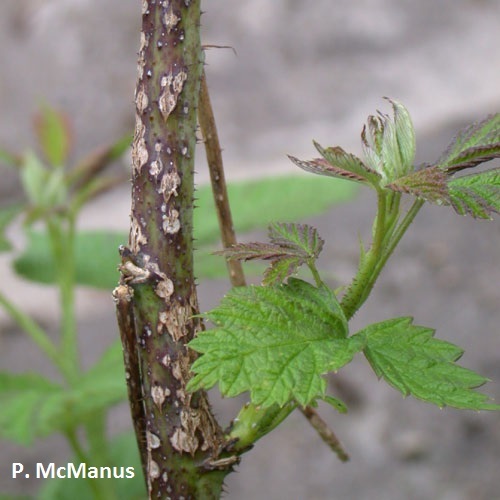 Lesions can occur on all parts of the plant but are most recognizable on canes. The lesions are round to oval, often sunken, and tan or gray in the center with a dark purple border. Lesions are usually small but may coalesce and affect large areas, a symptom known as “gray bark.” Affected bark becomes desiccated and often cracks. Infected canes are more prone to winter kill. The fruiting bodies of E. veneta form just below the cuticle or epidermis, and are not round and black like those of the fungi that cause cane and spur blights. Foliar lesions are small and yellowish at first, but as they enlarge they come to resemble cane lesions. The centers sometimes drop out to create a “shot-hole” appearance. Infected fruit will be hard and dry, and the stems of fruit clusters may be girdled by lesions. Proper cane spacing and weed control will maximize sun exposure and air flow and facilitate drying of canes. Do not work with canes in wet weather. Avoid overhead irrigation, as it soaks the foliage and contributes to splash dispersal of spores. Plant in full sun. Remove wild brambles growing in the vicinity, as they can act as a reservoir for the disease. Plant resistant or tolerant cultivars where they are available. The red raspberry cultivars ‘Heritage’,’Chilcotin’, and ‘Nootka’ are considered resistant. ‘Jewel’ is considered less susceptible than other black raspberries. Apply preventive fungicides in spring when buds are less than 3/8” long. Lime sulfur is a traditional choice. Full coverage of primocanes is important for effective protection.